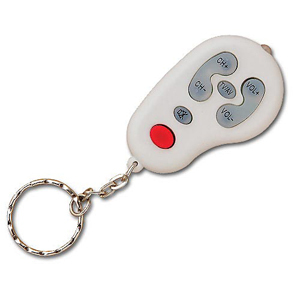 You can be the hit of the party and the bane of the host if you come with the covert clicker remote. Tired of watching the golf channel or heaven forbid, Lifetime, and want to end everyone's misery? Then one push of a button and the television suddenly changes to your favorite program. Freak everyone out by randomly changing channels and making everyone believe the house is haunted. Are you a wife and tired of your hubby always sitting in front of the television? 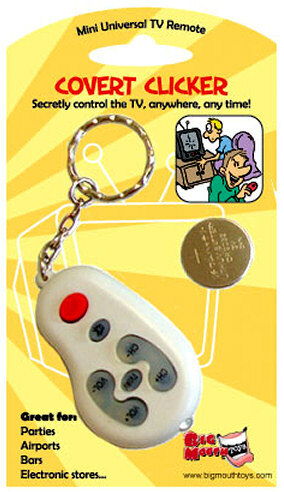 Covertly turn it off with the covert clicker and watch his confusion before saving the day with a couple's night out. We love a good joke, especially one that can annoy as well as entertain. That’s why we have the Covert Clicker Remote with us at all times. Parties, the doctor’s office or anywhere else that has a television is fair game for this awesome portable prank. Remember, he that controls the television, controls the house. THE ITEM DOES NOT WORK VERY WELL. I GOT IT TO WORK ONCE BUT THEN IT WOULD NOT WORK. THINK ABOUT IT---HOW CAN A $7.50 ITEM BE PROGRAMMED TO WORK ON 95% OF THE TV SETS MADE. I CAN'T RECOMMEND THIS ITEM BUT I HAVE HAD GOOD LUCK WITH OTHER ITEMS FROM FUNSLURP. I'M HOPING TO GET MY MONEY BACK FOR THIS ITEM. I�ve played so many jokes with this keychain that I�m surprised it still works! What a great find! One recommendation; make sure the kids don�t take it to school. Unfortunately, I received a call for my son�s teacher about a �ghost�.